Despite the fact that production of Gum Arabic is concentrated in African countries such as Sudan, Chad, and Nigeria, these countries export more than 75% of production to other countries such as France and the U.S., which are the major importers of Gum Arabic. Nexira International accounts for a majority of the revenue share generated in the Europe Gum Arabic market due to robust partnerships with an extensive network of high-quality raw material suppliers in Africa to ensure the security of supply and global reach. Other players in the market account for close to 50% revenue share because the global Gum Arabic market is highly fragmented owing to the presence of smaller manufacturers, distributors and companies. The report begins with an overview of the global Gum Arabic market. The overview mainly consists of market taxonomy and a section underlining factors influencing the development of the global Gum Arabic market. This report covers the global Gum Arabic market performance in terms of revenue contribution from various segments. The report also includes Persistence Market Research’s analysis of key trends, drivers, restraints and opportunities impacting the progress of the global Gum Arabic market. Impact analysis of key regional growth drivers and restraints based on the weighted average model along with key region-specific trends is included in the report to better equip clients with information and hidden insights. The report also provides key strategic recommendations for both existing and new players in the market to emerge sustainably profitable. 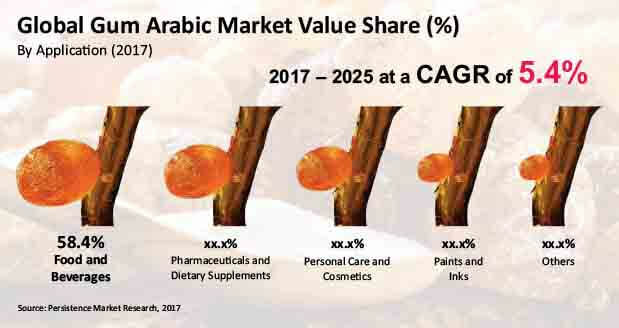 In the final section of the report, the global Gum Arabic market competitive landscape is included to provide report audiences with a dashboard view on the basis of categories of providers across the market, their presence in the global Gum Arabic market value chain and key differentiators. Persistence Market Research delivers information in the required format to the audience of this report. This team has conducted extensive interviews with industry experts and various industry participants for data collection and verification. In-depth secondary research is used to determine top industry players, products, applications, overall market size and industry connotations; and also to identify distributors and manufacturers. Data is validated using the triangulation method, wherein the secondary and primary research data along with Persistence Market Research’s analysis are consolidated to develop the final report. Yearly change in inflation rate has not been considered while forecasting market numbers. Top-down approach has been used to assess market numbers for each segment, while bottom-up approach has been used to counter-validate the reached market numbers. Macro-economic indicators such as food industry outlook and food and health supplement spending have been considered to arrive at the indicated market numbers. The food and beverages application segment is estimated to be valued at a little more than US$ 180 Mn in 2017, which is expected to increase at a CAGR of 5.7% over the forecast period, to be valued at more than US$ 280 Mn by the end of 2025. The segment is estimated to create absolute $ opportunity of more than US$ 8 Mn in 2017 over 2016 and incremental $ opportunity of a little more than US$ 100 Mn between 2017 and 2025. The food and beverages segment by application is expected to retain its dominance in the global Gum Arabic market throughout the forecast period, with near about 60% revenue share, followed by the pharmaceuticals & dietary supplements segment. Characteristic dietary fiber is necessary for bringing down blood cholesterol and controlling glucose levels. Gum Arabic contains 80%–85% natural dissolvable fiber, which binds all insoluble fiber in a diet. Rising interest for high dietary fiber content items among customers across the globe is resulting in rising number of producers, producing products with improved nature of Gum Arabic. This rising demand for dietary fibers is anticipated to fuel the growth of the food and beverages segment over the projected period. Demand for Gum Arabic for application as a natural binder in the bakery and confectionery industry is moderately high, and it represents no harm if consumed, unlike artificial or synthetic binders. Gum Arabic is broadly utilized in the food and beverages industry as an emulsifier in various product applications. Gum Arabic is steady in low pH conditions and is a moderately essential element for refreshments. Likewise, it displays low consistency properties in water and different fluids without evolving mouthfeel, flavor or texture of the original beverages. These advantages are encouraging key players in the global food and beverages industry to receive and increase applications of Gum Arabic in different food products. This increasing use of Gum Arabic in food products is creating a positive impact on the food and beverages application segment of the global Gum Arabic market. Increasing demand for easily soluble Gum Arabic among consumers in the global market is encouraging manufacturers to develop and produce new formulations such as instant soluble Gum Arabic. Instant soluble Gum Arabic solution is used in dry spray preparations for powder encapsulation, which is a technique that helps in the encapsulation of flavors, aromas, and colors. This increasing use of soluble Gum Arabic in beverages is anticipated to boost the food and beverages segment during the period of assessment. The food and beverages segment is estimated to be valued at more than US$ 35 Mn in 2017 in North America, and is expected to increase at a CAGR of 6.2% over the forecast period, to be valued at almost US$ 60 Mn by the end of 2025. In Latin America, the food and beverages segment is estimated to create absolute $ opportunity of US$ 0.53 Mn in 2017 over 2016 and incremental $ opportunity of US$ 5.9 Mn between 2017 and 2025. The segment is likely to increase at a CAGR of 5.4% during the projected period in Europe, while in the APAC Gum Arabic market, the food and beverages segment is anticipated to register a CAGR of 6.2% during the period of forecast.